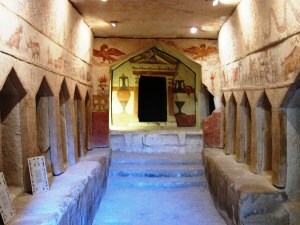 The Sidonian Tomb discovered at the biblical city of Beit Guvrin – Maresha in the foothills of Judea southwest of Jerusalem, is an extraordinary rock-carved and hand-painted burial complex. It belonged to Phoenician traders from Sidon that settled in southern Judea after Alexander the Great’s conquests (332 BC). Situated at the foot of the Judean Hills, between the Mediterranean coast and the mountains, Maresha was on an important trade route connecting Hebron and the port city of Ashkelon. Sidon was and still is an important seaport- just north of Israel, on the Lebanon coast. In bible times it was home to Phonecian traders that plied the Mediterranean establishing trading posts as far away as Spain and the Atlantic Ocean. They also settled here. From the time of Alexander the Great (3rd C. BCE) it became Greek speaking and as pagans they worshipped the Greek gods. In the tomb depicted here archaeologists found an inscription mentioning the wealthy head of the local Sidonian community buried here. His name was Apolophanes son of Sesmaios, leader of the Sidonian community in Maresha. On a human note, the inscription goes on to say that Apolphanes was a kind, loving, generous, and well liked person. And here we are remembering him over 2000 years later! A name and memory worth more than a person’s weight in gold – can anyone wish for more? For more information about visiting the Sidonian Tomb at Beit Guvrin Maresha, where Phoenician traders from Sidon settled at the time of Alexander the Great, contact veteran Israel guide & biblical archaeologist Zack Shavin at Land of Israel Tours. This entry was posted in Judea & Samaria and tagged Beit Guvrin, Holy Land, Israel, Maresha, Sidonian tomb by zshavin. Bookmark the permalink.